Home / Monday Night Matchup: Pick the winner and get Free Bids! Football season is upon as, and the only thing that could make this time of year even more exciting is with Free Bids. Wouldn’t you agree? That’s why we’re taking one of the most loved traditions in professional football programming – Monday Night Football – and turning it into a way for you to win Free Bids each and every week this season. Here’s how it works. Pick the Winner and Get Free Bids! Throughout the 2013 NFL Football Season (September 5, 2013 – December 24, 2013), we’ll have an application up on our Facebook page that will show you the two teams participating in the upcoming Monday night football game. All you have to do is select who you think will be the winner each week by clicking the vote button under the image of the team you’re choosing. After you vote, complete the form that appears along the right side of the app and click submit. Make sure you check the team you voted for when completing the form. If the team you chose ends up winning the game, then your account will be credited with 3 Free Bids! This contest will be repeated for each Monday Night Football game throughout the 2013 season, so every week is a brand new chance to win! You must submit your vote before each MNF game’s kickoff. See schedule and game times below. You cannot change your vote after it has been submitted. You can only enter once each week. Duplicate entries will be removed. This promotion is only eligible to QuiBids customers in Canada and the United States. 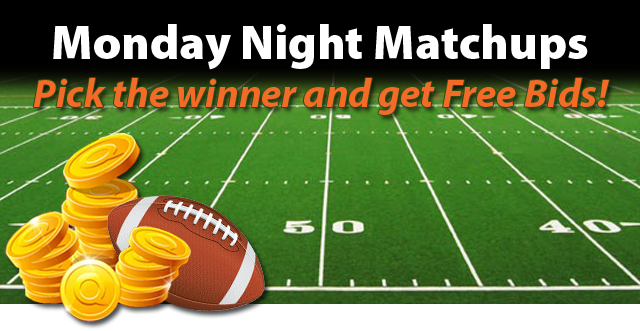 Winners’ accounts will be credited with bids 1-3 days after the conclusion of each Monday Night Football game. The first week of football will have two MNF games, but the contest will only apply to the first game of the night (Redskins vs. Eagles)*. Show the world that you’re a true football fan by sporting your favorite team’s gear from QuiBids. You can choose to bid on them in auctions, or Buy Now directly from the QuiBids Store and you’ll get Free Bids with each purchase! Browse some of our products via the “Tailgating” board on Pinterest or via the link below. Click here to shop for your favorite sports team’s merch on QuiBids. What two teams do you think will make it to the big game this year? We pick Cowboys and Broncos. Tell us your predictions in the comments below.